New Kickstarter campaign promises to bring the most innovative makeup blender to life. With its unique, sponge-like texture and super soft, platinum-grade silicone, the enavee mimics the material of a sponge, while soaking up virtually no expensive foundation. It has a modern, state-of-the-art design, which includes a precision “pinch” tip that keeps bacteria-laden fingers away, while simultaneously allowing for exceptional control of the applicator. Ena noticed that the makeup applicators on the market were either made out a sponge-like material or gel-silicone, and that each of these blenders had their pros and cons. The sponge would waste a lot of makeup, had to be thrown away in a few months, and could be very unhygienic. The gel-silicone blender solved all of these problems but when the reviews came in, users stated that it simply did not apply makeup well. Ena took the pros of each of these blenders, and this was how the enavee came to be. Unlike the typical sponge-like beauty blender, it is easy-to-clean, long lasting, and hygienic. 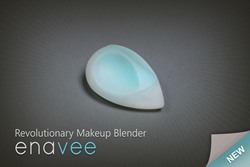 The enavee blender also applies makeup seamlessly, as opposed to the recently released gel-silicone blenders. As a long-time supporter of empowering women in leaders —in fact, she worked with UBC to encourage young women to pursue careers in engineering and science fields throughout her Miss World Canada campaign—Ena is hopeful that the development of the enavee can prove inspirational to other entrepreneurs. Now, after several iterations of design and prototyping, the enavee blender has been perfected. With help from supporters, it can be injection-molded, assembled, and shipped out in its beautiful packaging. Founded in 2017, enavee is a ground-breaking beauty company that aims to harness technological advances in order to innovate the beauty industry.